SUPER TOUGH silicone with chewable yet firm strength that can stand up to rough chewing. Each piece is easy to clean in the dishwasher or by hand wash/rinse. NON-TOXIC each piece is made of certified 100% food grade silicone that is non-toxic for worry-free chewing. Free of BPA, PVC, latex, lead, cadmium, heavy metals, phthalates. 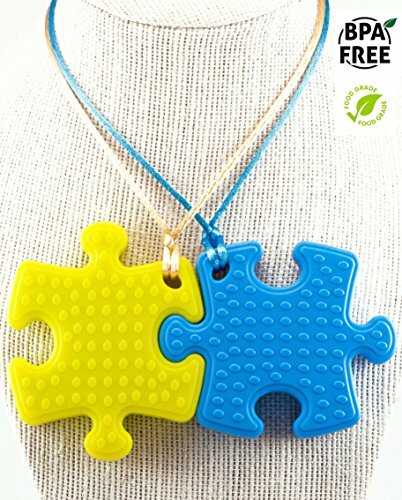 SENSORY stimulation-friendly puzzle piece shape has textured nubs one side and smooth texture on the other. VERSATILE design can be used as a teething tool, or to soothe children to adults wtih autism, ADHD, SPD, or other sensory needs. If you have any questions about this product by Blue Moon Toys and Games, contact us by completing and submitting the form below. If you are looking for a specif part number, please include it with your message.